These cookies has almost all the spice cabinet in it such as cinnamon, nutmeg, clove, ginger, coriander and white pepper. Speculoos cookie or Speculaas is a traditional Dutch or European spiced shortbread cookie that is traditionally baked to be consumed on or before St. Nicholas' Day (December 5th) in the Netherlands and December 6 in Belgium. In Germany they are made for Christmas. Normally Speculoos cookies normally don't rise that much because they don't use leavening agents but I like my cookies thick and soft and not so thin and crispy. You might know the cookies in Cookie Butter form. It is a very addicting spread that you can use it in sub for peanut butter. I made Cookie Butter Chocolate Chip Cookies a couple of months ago, you should go check it out. 1. Cream together softened butter, brown sugar, baking soda, baking powder and spices for 5 minutes or until light and fluffy. 2. Add room temperature eggs one at a time. 3. Slowly sift in three cups of flour into the dough then fold in the last cup of flour. 4. Cover dough and chill cookie dough for at least 4 hours or overnight. 5. Preheat oven to 325 degrees. Divide dough in half. Dust a little floured on a clean surface or a piece of wax paper (that's what I did). Roll dough into a 1/4 inch thick. Stamp cookies out using a cookie cutter then place in the refrigerator for 10 to 15 minutes. 6. Bake for 8 to 10 minutes, rotating halfway through baking. The cookies will still be firm to the touch and edges slightly browned. 7. Let cookies cool on cookie sheet for 5 minutes then transfer to a wired to cool completely. Store in a cool place. Enjoy! These cookies look so great! They are one of my favorite holiday cookies - love all the spices! Love all those sweet and spicy flavors - and the cookie cutter shape is perfect for the holidays! these sound delish and look like so much fun for the holiday season! Bring on the spices! Love these cookies! These look so good and I LOVE Speculoos!! Can’t wait to get baking this season! 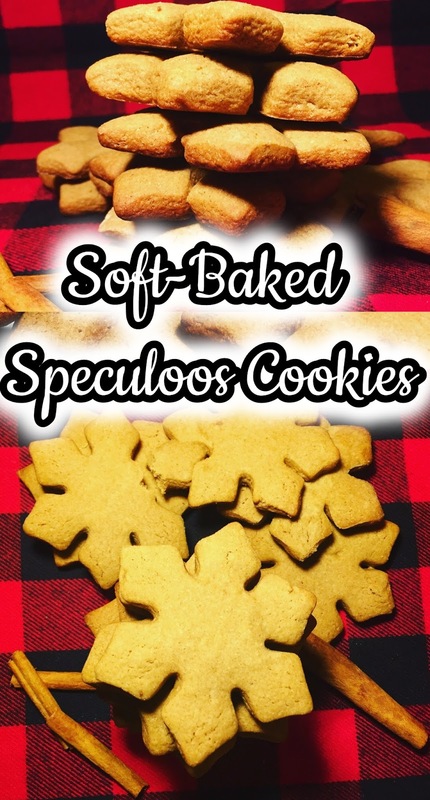 never knew there was something like Speculoos cookies, looks delicious! These sound so yum! Definitely one to try with the kids! This is absolutely looks good! I'll have to try it! Interesting! There is white pepper in these cookies. I may have to bring them to my mom's for her holiday get-together this year. YUM it looks so good! And I love the addition of nutmeg to the cookies!! This is my favorite cookie! I love a spicy cookie! I have some new cookie cutters and I shall be trying this out with them! Yum! These sound like a great holiday treat! Ooohh, I love a good shortbread cookie. I've never tried them with these spices, but they sound really delicious and very festive! I love all those spices! This looks like the perfect cookie to enjoy with a hot cup of tea! This sounds like a spice cake in cookie form. It is that wonderful tasty time of year. Perect for the holiday parties. I just love your idea about making these cookies soft and chewy. I can't wit to make them for myself. Such a perfect cookie for the holidays! Love all those spices. In the area of Germany I grew up in, we would enjoy Spekulatius cookies throughout December with themed ones for Nikolaustag too. I love a good spice cookie. I can tell by looking at the ingredients that I'm sure they tasted perfect! Aw! Those cookies look so cute and yummy! That is so tempting to bite, but I don't want to ruin its cute shape. Help me please. Haha! I would love to try this at home. The recipe is easy and the cookies look great! Even I prefer thicker and softer cookies to the thinner, crispier ones. These cookies are amazing, having lived in Holland for four years you can not help but try these, its so nice to see a recipe for them so I can make them at home, thank you! Speculous cookies. .so that's what they are! I discovered these a few years back at Traders Joes. They were delicious paired with their speculous cookie butter. Bet yours are as good! oh I just knew the name of this cookie, very unique history and indeed a delicious kind! I wish to make one of these one day for the whole family. These cookies look so delectable and mouthwatering treat to me. With recipe and pics displayed by you in detail these can be well tried at home. I can imagine how delicious these cookies are, with all those spices in them. I have tried speculoos chocolate from Belgium before and it was delicious! These definitely look interesting. I just wonder if the spices would be to overpowering for me. Oh yum. These look and sound really tasty. I am dreaming about crumbling the over soft vanilla ice cream. These look like a recipe my husband makes. A little different and maybe a bit more fancy. Thanks for the recipe. These cookies looks delightful and I really love the shape of it. Will give the recipe a try. Ooh yum these look really nice, and definitely will make a nice addition to a coffee morning or bake sale. Thanks for leaving the recipe too I have saved it to try!